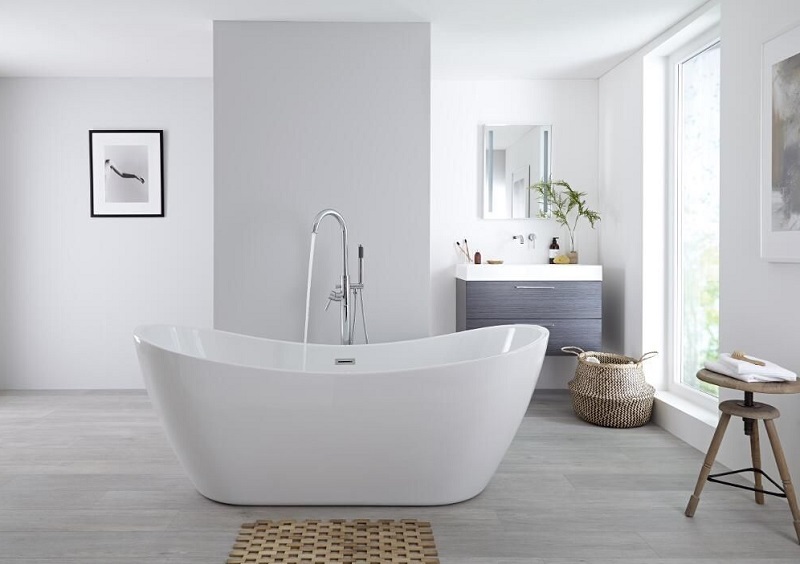 With so many types of baths to choose from it can be difficult trying to decide on a style that‘s right for your bathroom, so we’ve created this handy buyer’s guide to help make your decision easier. Find out everything you need to know about freestanding baths, shower baths and more. 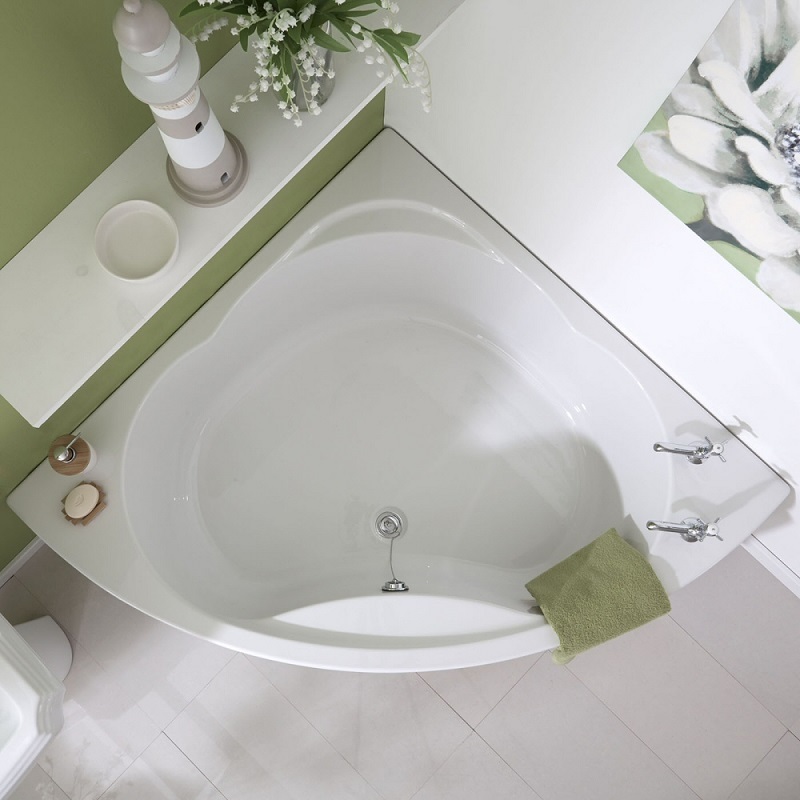 When choosing a new bath, the first thing to consider is the available space in your bathroom. Baths are available in a wide range of sizes, as well as styles and designs. If you’re planning a new bathroom, make a scale drawing of the space so you can see where a bath could fit, alternatively, if you are just replacing a bath, then simply measure around it to find out the size you’ll need. Also, consider where the taps will go, i.e. 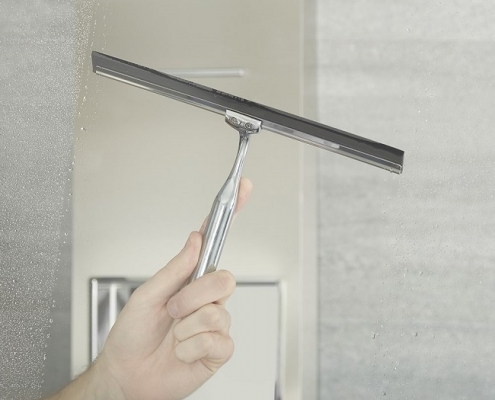 mounted on the wall, in the floor or on the bath itself. Some baths have pre-drilled taps holes ready to take your choice of taps, but some are undrilled, which gives you more flexibility in where to position them. See our tap buying guide for more information on bath taps. Straight baths need a panel to add the finishing touch. There’s a wide range of bath panels to choose from in various finishes and sizes. You may also want to choose a bath screen if you’re having a shower fitted over the bath. See our DIY guide on how to fit a bath panel and how to fit a bath screen. Acrylic baths – these come in a wide range of shapes and sizes, and they offer a great deal of design flexibility. Steel baths – these offer less design flexibility, but are very sturdy and hardwearing. Freestanding baths – usually made from acrylic and are available in traditional and contemporary styles. Shower baths – a popular option due to the incredible flexibility of use they offer. 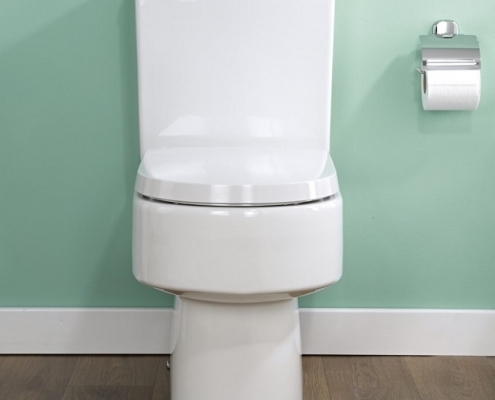 Corner baths – offer clever solutions for awkward shaped bathrooms. Production: Whether straight or a corner style, acrylic baths are constructed in the same way. They consist of two layers: one is an acrylic sheet that’s usually 4mm or 5mm thick, which is moulded to the desired shape using a vacuum form process. The acrylic then needs strengthening, which is achieved by attaching a wooden baseboard to the bottom of the moulding and then spraying a glass reinforced plastic material evenly to the underside of the acrylic moulding and wooden baseboard. Production: Freestanding baths are manufactured using a unique method of production – this involves two sheets of acrylic, which are reinforced and bound together with a polyester casting resin. To improve heat retention, a thermal vacuum is created between the outer and inner acrylic sheets – this process results in a strength and durability that will last many years. Always clean an acrylic bath immediately after use. It’s much easier to remove the film of insoluble soap residue and grime at this stage that will otherwise harden on the side of the bath. In hard water areas, calcium salts are deposited below the waterline and under leaking taps. If this deposit builds-up, it becomes increasingly difficult to remove and looks unsightly. Prompt cleaning is once again the answer. Clean acrylic baths with hot soapy water and a cloth, and use another clean cloth to wipe the bath dry. These are the most popular type of bath as they are simple and easy to install. 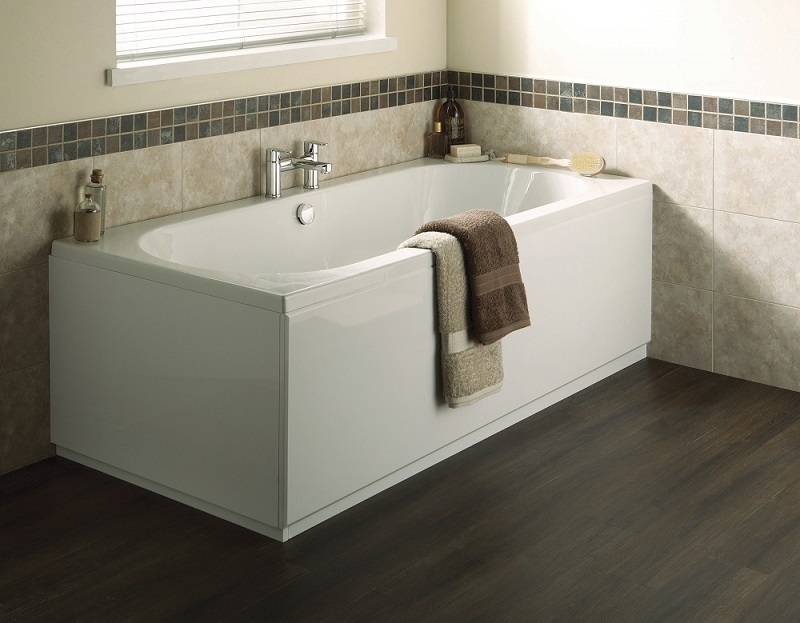 Straight acrylic baths are available in a range of sizes, as well as single and double-ended designs. Steel baths are usually made from a 2.2mm steel sheet, which has a durable gloss enamel finish that’s fired onto the surface. They usually have two pre-drilled tap holes and can be supplied with or without grips. Steel is a good conductor of heat and will take on the temperature of the bath water, the heat absorbed by the steel bath conducts back to the bath water as it cools. 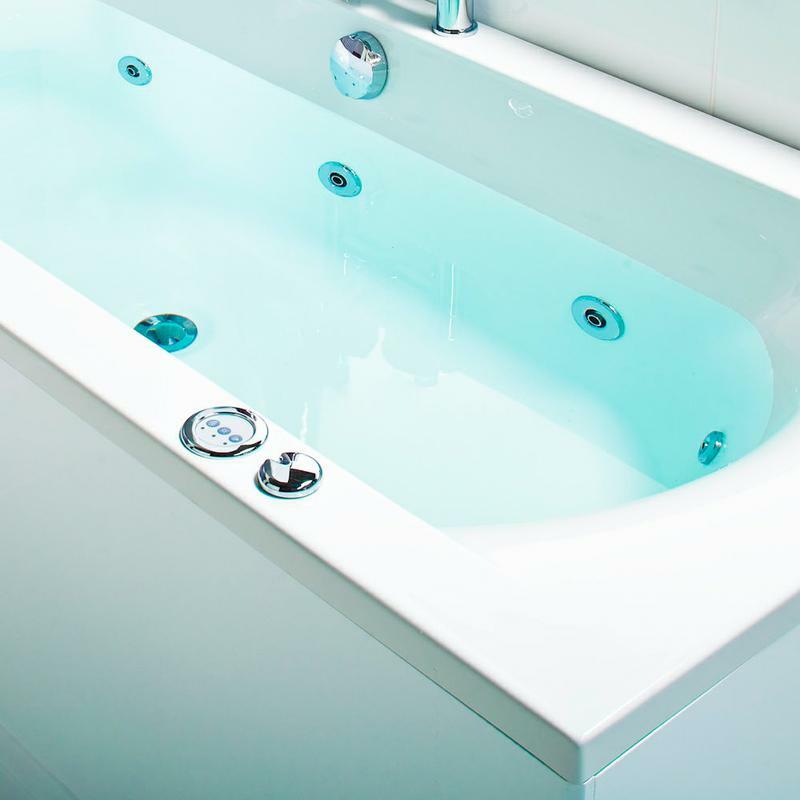 The cooling properties of bath water for steel and acrylic baths is very similar as most of the cooling effect takes place from the water’s surface and not through the bath itself. Shower baths are also a popular option, as they combine plenty of space for bathing and showering, making them ideal for bathrooms that don’t have enough room for a separate bath and shower enclosure. Shower baths are available in left and right hand variations, as well as p-shaped and square designs. 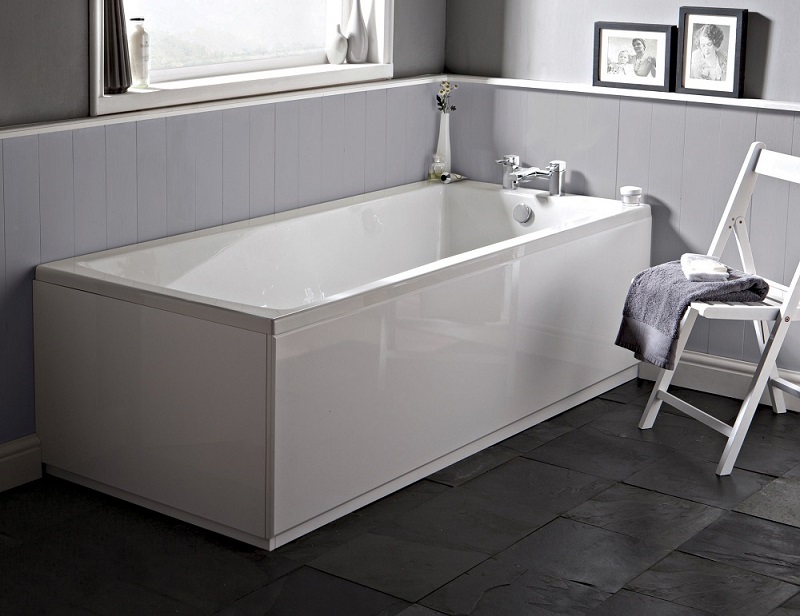 Available in a range of sizes and designs, corner baths are ideal for awkward shaped bathrooms. Offset corner baths are available in left or right hand variations, while standard corner baths are not handed. 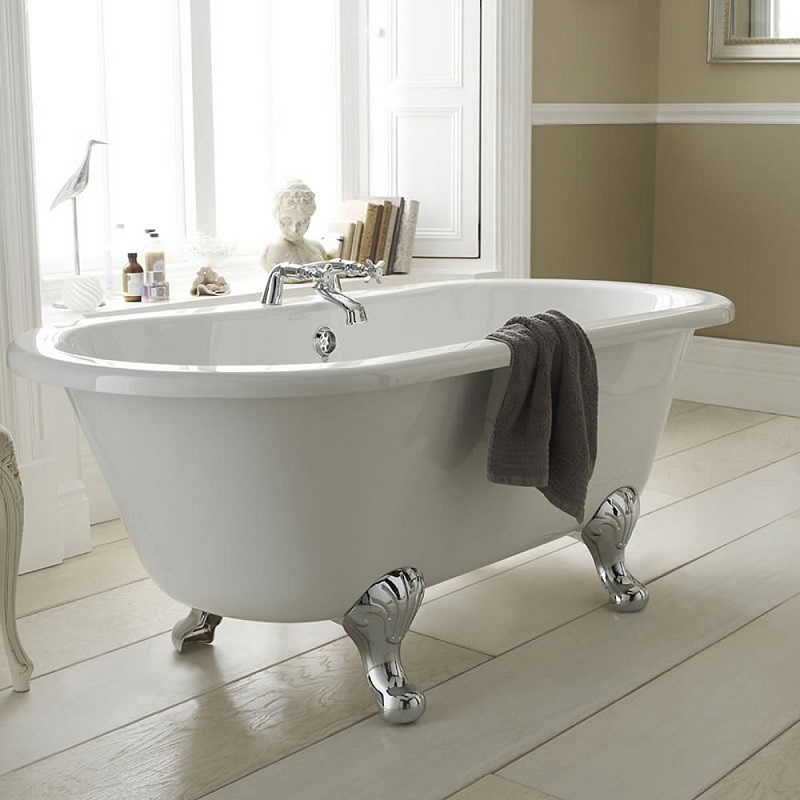 Slipper baths are a specific shape of freestanding bath where one end is higher than the other. The bath taps are located at the lower end, which allows the higher end to be used as a back support whilst bathing. 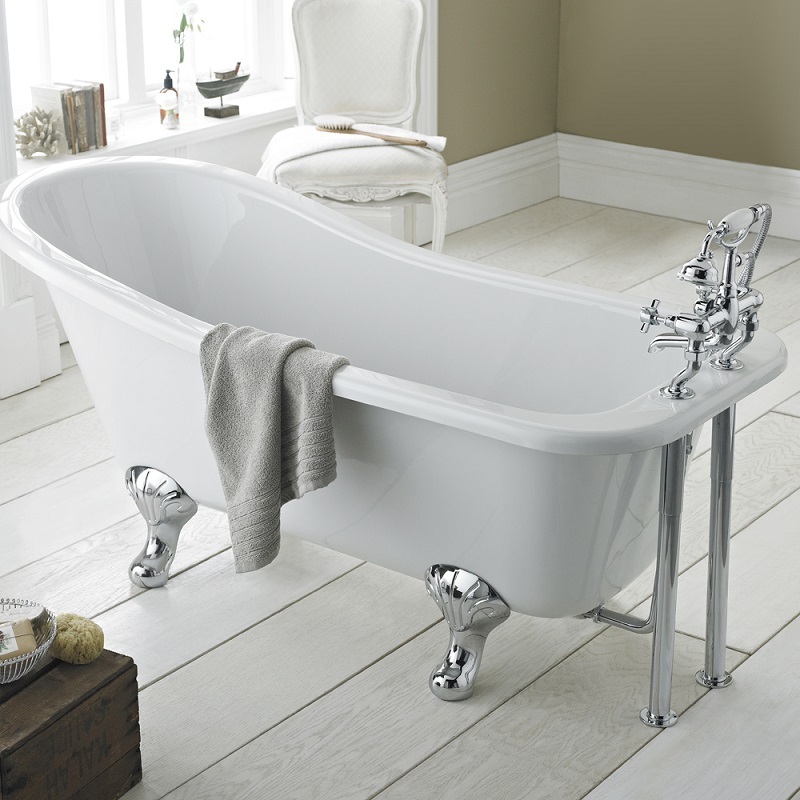 Discover more about freestanding baths in our buyer’s guide. Freestanding roll top baths are available in modern and traditional styles, as well as single and double-ended designs. They are the perfect option for adding luxury to any bathroom and provide a relaxing bathing experience. Available in a range of sizes and shapes, whirlpool baths provide the ultimate relaxing bathing experience. Airpool baths pump air through the base of the bath, while whirlpool baths pump water through the side jets. Some models incorporate both options. 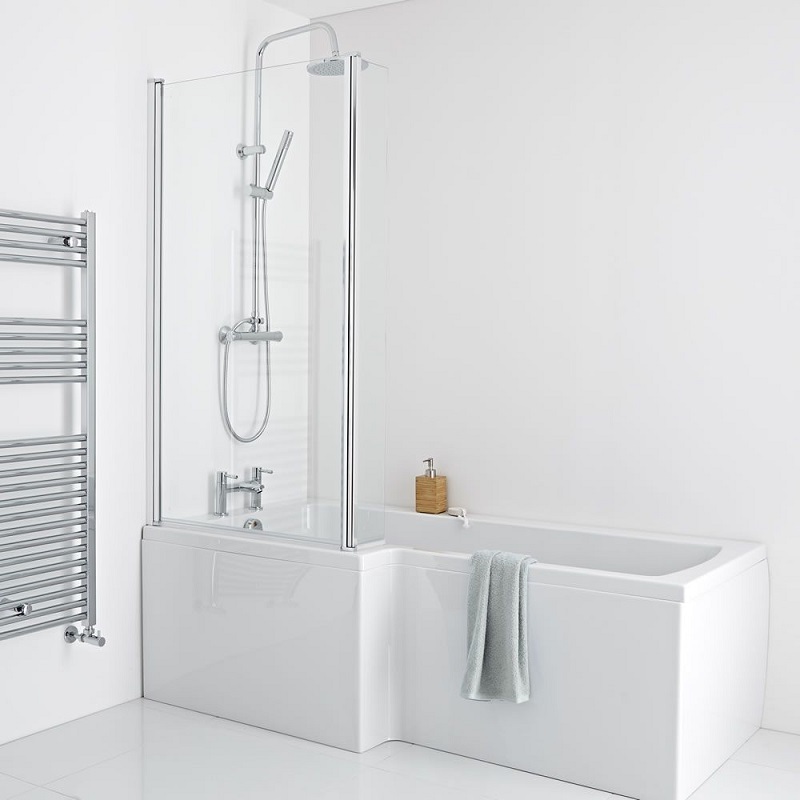 This style of bath does cost more to buy and fit, you’ll also need to be aware of the installation and plumbing that will be required, and access to the pipework is essential. For more information read our whirlpool baths buyer’s guide.